The goal is to reduce the volume of the nucleus pulposus, thereby achieving a decompression of the nerve roots. Another treatment option is to sclerotize nociceptors in the dorsal annulus curvature. There is also the term High Intensity Zone (HIZ), which is represented in the MRT as a visible sign of disc degeneration (bright zone in the disc ring). There are two different sets of instruments available that are specially optimized for procedures on the cervical and lumbar spine. Axial (left) and sagittal MRT of a HIZ (High Intensity Zone) in the cervical spine. 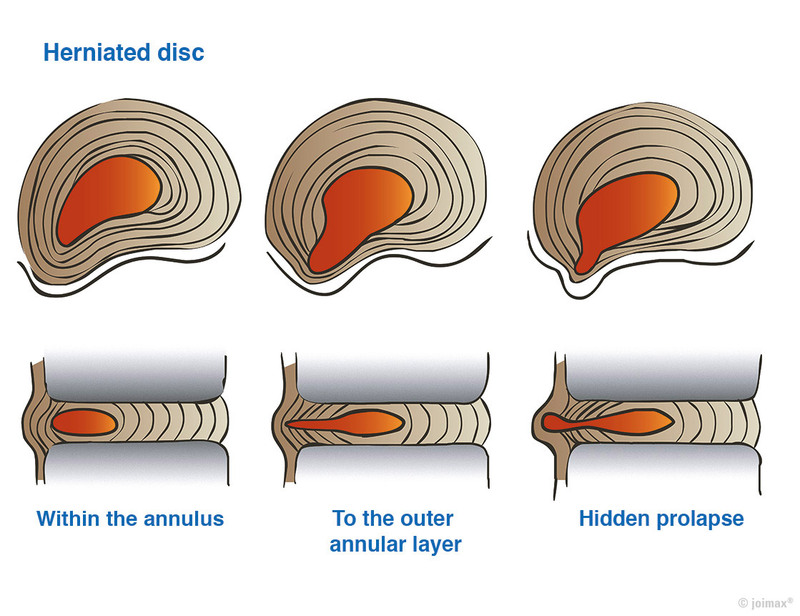 Decompression of the nerve root by reducing the volume of the nucleus pulposus in the event of a disc protrusion, a hidden prolapse or annular fissures. 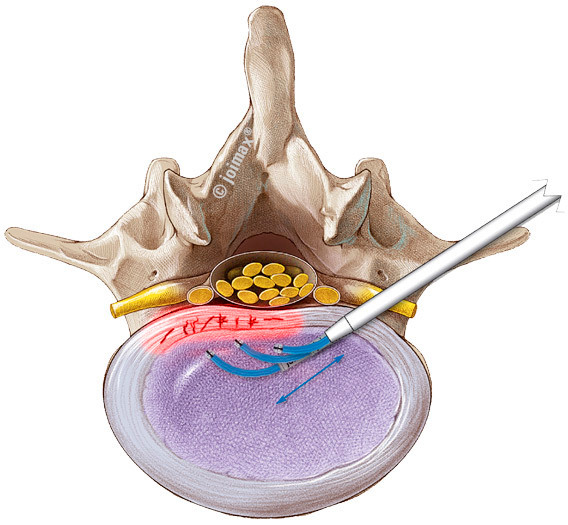 The purpose of the intervention is to reduce the volume of the disc core, in order to relieve the pressure on the nerve. 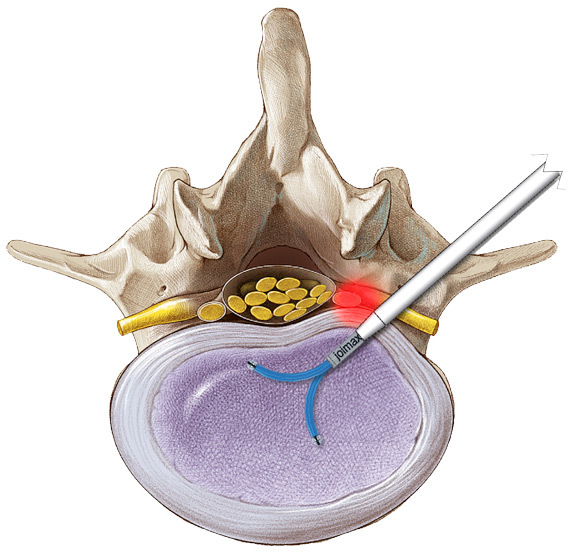 To that end, access to the disc is obtained using a small “tube” and then either tissue is removed using forceps or using a bipolar RF probe (e.g. Vaporflex®), the volume of the tissue is reduced via vaporization – both can be combined in the same intervention. The advantage of removing tissue is the opportunity for histological examination. At both start and end, the intervention can be checked using an endoscope. Dorsal annular fissures can be treated using the bipolar Vaporflex® probe, by applying heat to seal small tears in the disc ring. This effectively relieves the pain and prevents further disc damage. 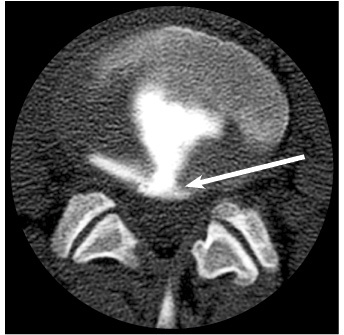 CT discogram (axial) for L4 with visible annular fissure (arrow).